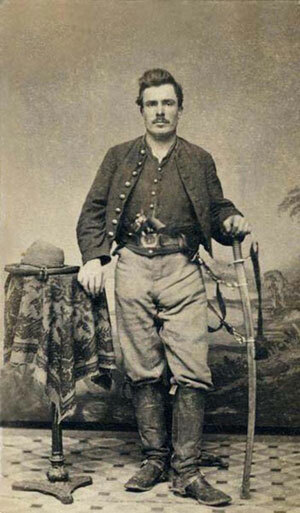 Thomas came to the Rio Grande Valley of Texas as a Union soldier during the Civil War. He served as a Union Mail Carrier stationed at Las Cuevas near Sullivan City, Texas. Handy’s mail route took him down Military Road where many of the original Spanish Land Grant settlers lived. One ranch a long that road was the Azadores Ranch which was part of the La Blanca Land Grant owned by Salvador Cavazos. Thomas met his future wife Angelita Cavazos there. During the Civil War, Courier Stations were established at intervals of 20 miles, from Brownsville to Laredo, through which semi-weekly mail runs were transmitted. Besides these duties, the regiment was employed in enforcement of revenue laws, with frequent scouting expeditions to protect the many residents, and their property from Indians and other marauders. Fought on 28 July 1861 at Relay House, MD. Fought on 09 July 1862 at Vicksburg, MS. Fought on 15 July 1862 at On Gunboat "Tyler". Fought on 15 July 1862 at Yazoo River, MS. Fought on 21 July 1862 at Vicksburg, MS. Fought on 13 April 1863 at Bisland, LA. Fought on 28 April 1863 at Vermillion, LA. Fought on 28 May 1863 at Port Hudson, LA. Fought on 29 May 1863 at Port Hudson, LA. Fought on 03 June 1863 at Clinton, LA. Fought on 14 June 1863 at Port Hudson, LA. Fought on 20 June 1863 at Jackson, LA. Fought on 04 July 1863 at Port Hudson, LA. Fought on 06 July 1863 at Clinton, LA. Fought on 08 September 1863 at Baton Rouge, LA. Fought on 29 September 1863 at Baton Rouge, LA. Fought on 05 October 1863 at Baton Rouge, LA. Fought on 23 October 1863 at Baton Rouge, LA. Fought on 08 November 1863. Fought on 11 January 1864 at Clinton, LA. Fought on 01 February 1864 at New River, LA. Fought on 08 February 1864 at Doyle's Plantation, LA. Fought on 08 February 1864 at New River Landing, LA. Fought on 09 February 1864. Fought on 15 February 1864 at Baton Rouge, LA. Fought on 08 March 1864 at Baton Rouge, LA. Fought on 14 March 1864 at Baton Rouge, LA. Fought on 01 April 1864 at Baton Rouge, LA. Fought on 02 April 1864 at Baton Rouge, LA. Fought on 03 May 1864 at Comite River, LA. Fought on 11 June 1864 at Clinton, LA. Fought on 03 July 1864 at Rosedale, LA. Fought on 06 August 1864 at Plaquemine, LA. Fought on 25 August 1864 at Clinton, LA. Fought on 28 August 1864 at Clinton, LA. Fought on 05 October 1864 at Comite River, LA. Fought on 10 October 1864. Fought on 10 October 1864 at Clinton, LA. Fought on 08 November 1864. Fought on 15 November 1864. Fought on 15 November 1864 at Camp Beauregard, LA. Fought on 17 November 1864 at Liberty, MS. Fought on 03 March 1865 at Olive Branch, LA. Fought on 05 March 1865 at Olive Branch, LA. Fought on 07 March 1865 at Clinton, LA. Fought on 27 May 1865 at Port Hudson, LA. Fought on 02 June 1865. Fought on 04 February 1866 at Brownsville, TX. Sam H. Ybarra, Thomas J. Handy great great grandson emal and website.